We’ve long known that red blood cells are designed in a way that enables them to move smoothly through narrow blood vessels, en route to delivering oxygen to tissues. But not a lot of thought has been given about whether the structure of these cells might also come into play during blood clotting and wound healing. While using a new desktop version of a nuclear magnetic resonance machine to examine blood as it was clotting, researchers at the University of Pennsylvania were mystified by the signals the instrument produced. The data were inscrutable, so they decided to examine the blood clots further using a scanning electron microscope—and what they saw was stunning. The red blood cells had morphed from their usual discs into angular shapes that were packed tightly together. The Penn team named this new red blood cell conformation a polyhedrocyte, derived from the Greek word “polyhedron,” which refers to a solid shape with flat faces, straight sides, and no curved surfaces. The discovery illuminates the rather complicated, two-step process involved in the clotting of blood. When a clot first forms, it is a nearly random mix of platelets, which are sticky, disc-shaped fragments of cells, and a thread-like protein called fibrin. 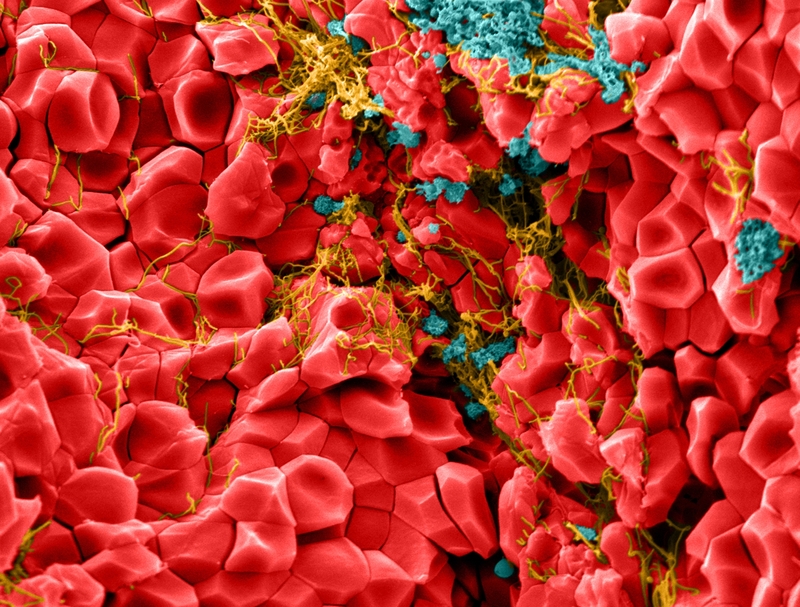 Soon, red blood cells start getting trapped in the platelet-fibrin framework. However, because of their disparate shapes, the red blood cells, platelets, and fibrin do not fit together tightly, resulting in a clot that is full of leaky holes. That’s when clot contraction kicks in. As proteins in the platelets tug on the fibrin strands, the clot reshuffles its three components. The platelets and fibrin are pushed to the outer edges of the clot. Meanwhile, the disc-shaped red blood cells are squeezed to the center, where, under the influence of this tight packing, they take on a new angular shape. Thanks to this change in geometry, the clot now has no gaps, creating an impermeable seal that stems bleeding. Contraction not only makes the clot less leaky, it also serves to shrink the clot—an essential step that reduces obstruction of blood vessels, helping to restore the flow of blood necessary for wound healing. The implications of the new findings extend beyond cut fingers and scraped knees. This same phenomenon may explain why clot-busting drugs, like tissue plasminogen activator, work best if administered as soon as possible after strokes and heart attacks. The longer the lag time, the stronger the clot becomes—and the less effective drugs may be in penetrating and dispersing the tightly packed polyhedrocytes. The Penn researchers plan to continue their investigations of these super-strong cellular rescue teams—with the goal of figuring out better ways both to form them and to bust them up. Clot contraction: compression of erythrocytes into tightly packed polyhedra and redistribution of platelets and fibrin. Cines DB, Lebedeva T, Nagaswami C, Hayes V, Massefski W, Litvinov RI, Rauova L, Lowery TJ, Weisel JW. Blood. 2013 Dec 13.